Two coal companies operating in eastern Kentucky continue to routinely and illegally discharge toxic pollutants into local streams, including streams used by several towns for their drinking water supply. "The sheer number of very serious pollution violations we found in the first three months of 2011 is astounding," said Donna Lisenby, the director of Water Programs for Appalachian Voices, which compiled public records that document the pollution. "It shows a systemic and pervasive pattern of ongoing water pollution problems with no meaningful enforcement by Kentucky Energy and Environment Cabinet officials, who continue to sit idly by and let coal companies get away with thousands of violations." The companies self-reported the violations to the Kentucky Energy and Environment Cabinet. State officials have taken no action to stop the illegal discharges. The violations included average monthly total suspended solids (TSS) levels that were up to 15 times higher than allowed by the permit, average monthly manganese and iron levels that were than 3-10 times higher than allowed, the daily maximum for iron up to 13 times higher than allowed, as well as numerous pH, alkalinity and acidity violations. "These violations represent a toxic soup being poured into our drinking water and streams," said Ted Withrow, the retired Big Sandy Basin Management Coordinator for the Kentucky Division of Water and a KFTC member. "A recent peer-reviewed study shows a strong correlation between mountaintop removal mining and a 42% increase in infant deformities and other health effects. We now have proof we are killing children because of lax enforcement. Governor Beshear must step in and stop these outlaws from harming the unborn." 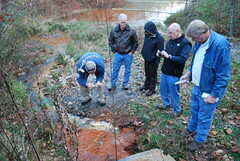 County with U.S. EPA officials. The four groups plus several individuals sent 60-day Notices of Intent to Sue to the two companies today. This is similar to action the groups took last October when they threatened to sue ICG and Frasure Creek for 20,000 Clean Water Act violations. That prompted Kentucky Energy and Environment Cabinet officials to take industry-friendly actions to short-circuit the potential citizen lawsuits. With a light slap on the wrist, the officials proposed a settlement with the two companies, citing only 2,765 violations of the Clean Water Act and proposing fines of just $660,000. One of the arguments they used to justify the small number of violations and low penalties was that many of the violations were merely "transcription errors," not violations of pollution limits, and therefore did not warrant higher fines. At the end of the negotiation process, the cabinet officials proudly proclaimed that the proposed settlement would remedy the ongoing problems with these two companies. Today's filing proves otherwise. "These new violations show two things," said Scott Edwards, director of Advocacy for Waterkeeper Alliance. "First, it exposes the cabinet's deal with the coal companies for the ineffective, choreographed sham we always knew it was, and second, it shows that it is almost certain that all those 'transcription errors' the cabinet relied on to soft-pedal its settlement approach were really pollution discharge violations disguised as reporting errors." "These are serious ongoing violations of the law," added Withrow.. "Cabinet should not step again to shield these companies it would be waste of taxpayers' money, and money the cabinet does not have to spare. These coal companies do not require taxpayer protection." Under the Clean Water Act, the companies have 60 days to respond to the allegations made in the notice letters. If, at the end of that period, all violations have not been corrected, the groups and individuals will pursue citizen enforcement, which can include filing a complaint in federal court. The plaintiffs are being represented by Mary Cromer with the Appalachian Citizens' Law Center, Lauren Waterworth of Boone, North Carolina, Burke Christensen of Richmond, Kentucky and the Pace Environmental Litigation Clinic in White Plains, New York.